I'd been looking forward to reading 77 Shadow Street by Dean Koontz for a while. 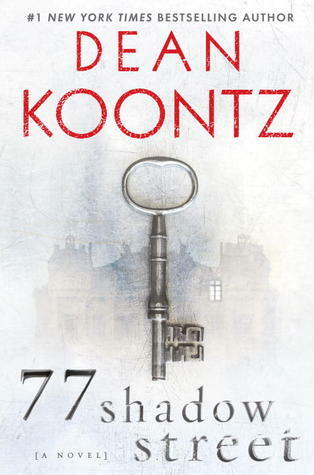 It was published in 2011, and when I didn't receive it for Christmas that year (my family knowing I'm a big Koontz fan), I was a little disappointed. Well, now that I've read it (from the library), I'm so glad no-one I know spent a single dollar on this book. It was rubbish. In essence, 77 Shadow Street is about a building called the Pendleton, built on top of Shadow hill in the late 1800s. Every 38 years, something weird happens on this site - even the Indians knew to steer clear of this place - and it has been the site of murders, suicides, madness and disappearances. Koontz introduces the reader to the current tenants of the Pendleton, and through each of them we experience this round of weirdness as the 38 years is about to kick in and the past, present and the future cross over. "I am the One, the all and the only. I live in the Pendleton as surely as I live everywhere. I am the Pendleton’s history and its destiny. The building is my place of conception, my monument, my killing ground. . . ."
77 Shadow Street has elements of horror as Pogromites pursue and kill the tenants and the One controls everything. I thought this was a weak plot, the horror scenes were gross and frightening but without being engaged with the narrative I found them pointless and wasted. I remain a fan of Dean Koontz and most likely always will, but go on the record as saying 77 Shadow Street is a dud read; don't bother.